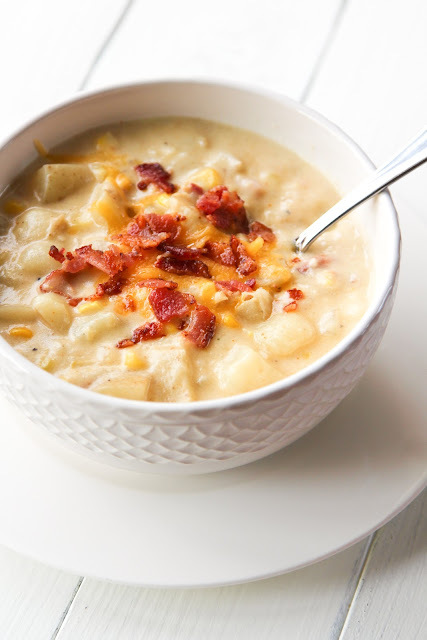 Potato Corn & Bacon Chowder - Hi, friend Popular Recipes, in this article entitled Potato Corn & Bacon Chowder, we have prepared this article well and concise to be easy to understand for you to read and can be taken inside information. hopefully the contents of the post Article cooking, Article food, Article recipe, Article soup, that we write this you can understand and useful. okay, happy reading. I absolutely love soup! My husband can attest to the fact that I make soup about 2-3 times a week. I'm not sure how much he loves it, but he never complains ;) This soup is one I've made before and keep coming back to. It's chunky, creamy and topped with crisp pieces of bacon. Let's be honest, everything is better with bacon! I like to add leek to it in the fall because it really gives the soup added flavor and texture. Also fresh corn is definitely the way to go but if you can't get your hands on some, try frozen. One thing I really love about this soup is that it comes together in 30 minutes... that and the fact that it's an entire meal in one bowl. It's hearty and filling and will definitely keep you coming back for more! 1. Set a large stock pot or dutch oven over medium-low heat. Add butter and melt. When butter has melted add onion and leek. Add a pinch of salt to help the onion and leek sweat and cook for 4-5 minutes until tender and transparent. Add garlic and corn and cook for 3 more minutes. 2. Sprinkle in flour and whisk. Slowly add chicken broth and then milk. Turn heat up to medium-high, then add potatoes. Season with salt, pepper and cayenne. Simmer for 30 minutes or until potatoes are tender. 3. Once the potatoes are tender and the soup has thickened, turn heat off. Add in cheddar cheese and stir until incorporated. Spoon into individual bowls and top with crisp bacon pieces. Serve immediately. Thank You and Good article Potato Corn & Bacon Chowder this time, hopefully can benefit for you all. see you in other article postings.